Which is why we love him so, oh yes. Merry Christmas, friends. If my GF read your blog, I'd totally hate Smart Man... making the rest of us look like complete slackers. I did get Jule the spa day, but doooooood! the ring was just to make the rest of us look bad. Nathan, it's worse than you thought. 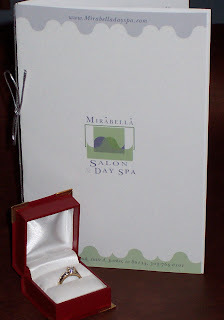 The spa day was coordinated with two other couples we know, and all three gals got a "Ladies Night Out" package, which includes a night at a fancy hotel with Champagne, etc. as well as the spa day. Why, yes, Nathan. You are. I still have one surprise under the tree (to be opened on New Years). I suspect it's even worse/better. Steve, your bitterness at being out-gifted will not deter me from my smug superiority at choosing the best Smart Man. What a GREAT gift. My smart man did the bling but not the spa day, opting for electronics instead, which works just fine for this geeky girl.